Named after a legend of Louisville, the “Bumblebee” tunnel-boring machine is carving a path to cleaner water, regulatory compliance, and lasting resiliency. Yes, the citizens of Louisville are proud to show off our community to the world during Kentucky Derby season. Whether it’s Churchill Downs, bourbon distilleries, our unique restaurant scene, or renowned performing arts, museums, and parks, there are many points of pride. But there’s a new point of pride here that most people will never see. Louisville Metropolitan Sewer District (MSD) is investing more than $200 million in its Waterway Protection Tunnel — a massive project deep underground that, when complete in two years, will store overflow from a combined sewer system and help create safer and cleaner waterways. With its roots as a river city, Louisville knows its waterways are crucial. The community itself was founded when flatboats traveling down the Ohio River in the late 1700s would have to stop and portage around the falls of the Ohio River. The town grew up around the falls, and today the Ohio River and the waterfront are part of our identity, as well as creeks and streams that are important assets to neighborhoods and parks. That’s why MSD has placed a high priority on reducing the negative environmental impact of sewer overflows — the release of untreated wastewater that occurs during heavy rain events when the system is at capacity, harming local wildlife and plants and potentially exposing people to bacteria and pathogens. Like many other cities, Louisville has signed a consent decree with the U.S. EPA and other agencies, committing us to reduce combined sewer overflows (CSOs) by 98 percent by 2020. Since the consent decree was put into place in 2005, Louisville MSD has completed hundreds of transformative wastewater projects across the community to work toward this goal. It is expected that over the two decades of the consent decree, MSD will have invested more than $900 million in improvements to reduce CSOs by 98 percent — and by 100 percent in the separate system — in a typical rainfall year. While the plan to complete the consent decree was set in motion in 2005, we’ve continually looked to innovate and to seek out new and better approaches to meet our goals. A large part of capturing the CSOs is building large storage basins. MSD has constructed nine basins and had planned to build four more. However, due to the increasing cost to build basins, together with favorable financing for mega-projects and the availability of new boring machinery, MSD saw an opportunity. And that opportunity presented itself 18 stories underground. Instead of building four additional giant storage basins in several areas of the city — causing construction disruption and inconveniences to multiple neighborhoods and thoroughfares — MSD will achieve the same goal by building the Waterway Protection Tunnel. 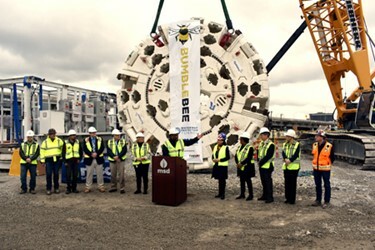 At 4 miles long and 20 feet in diameter, the tunnel will capture and store the stormwater and wastewater that otherwise would combine and overflow into local waterways during periods of heavy rain. Then, when the rain subsides and sewer system capacity is available, MSD will pump the water from the tunnel back into the collection system, where it will travel to one of the treatment facilities to treat the water before releasing it into waterways. The tunnel will have capacity to store up to 55 million gallons, or the equivalent of 83 Olympic-sized swimming pools. It will take the place of four previously planned storage basin projects. In all, the tunnel provides 11 million gallons more storage capacity with less above-ground construction disruption to neighborhoods and with lower operational and maintenance costs compared to basins. Building the Waterway Protection Tunnel is an amazing feat of engineering, and I’m proud to be involved with this project. The path to constructing a tunnel isn’t necessarily straight. While it might seem a matter of going from Point A to Point B, it takes a lot of work just to get to Point A. 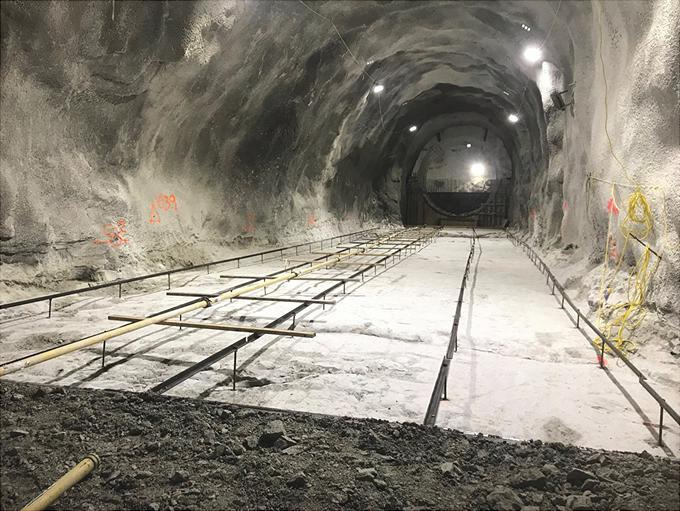 Before construction began on the tunnel itself, crews drilled a series of rock core borings along the proposed tunnel alignment to collect rock core samples. 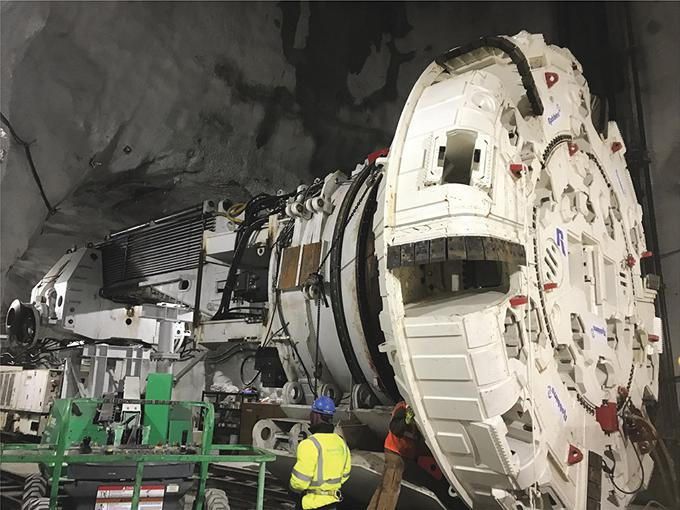 These samples helped give a better understanding of the physical characteristics of the bedrock in the project area to determine the tunnel depth and specify the correct type of tunnel-boring machine. Those samples also revealed history. Geologists determined the rock samples included fossilized remains of sea creatures from 500 million years ago when present-day Louisville was located south of the equator. These fossils included horn corals, clam-like brachiopods, and rugose coral. To build the tunnel, we have to go deep — 200 or more feet. That means creating both a pump station shaft and working shaft. Essentially, these shafts are deep entry points into the ground that allow access for equipment and workers. These shafts are so large that a 1,000-square-foot single-story ranch house could fit into them. To dig to the depth of 200 feet, we excavated through 50 feet of soil to get to the rock surface, then used explosive charges to blast away rock, alternating between the two shafts with two blasts per shaft each week. The blasts, which create about 10 feet of depth, are muffled using sand, rubber mats, and a special shaft cover, allowing the blasts to produce less noise and vibration than normal vehicular traffic. The loose rocks within the shafts are then excavated, and the process repeats. We are now to the critical point in the project, as our entrance shafts have been built and we are preparing to begin tunnel excavation. 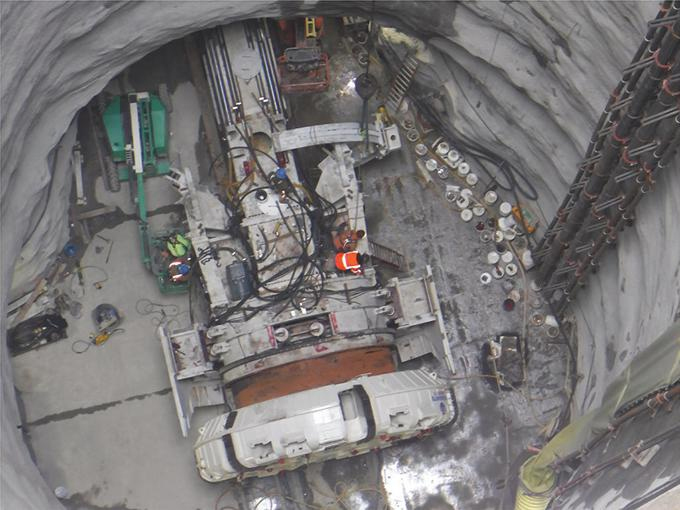 The tunnel-boring machine, which is longer than the length of a football field, will act as a giant, moving drill. MSD celebrated the arrival of the tunnel-boring machine (it arrived in parts on more than 50 tractor trailers) in November 2018 with an official christening ceremony, where we unveiled the name for the machine. After a naming contest among MSD employees, the name that rose above the rest is in honor of one of Louisville’s greatest champions and inspirations. MSD Accounting Analyst Mike Fitzner submitted the name “Bumblebee,” in honor of Muhammad Ali, and for Ali’s famous phrase “Float like a butterfly, sting like a bee.” Similarly, the tunnel-boring machine will move virtually unnoticed 18 stories underground while performing a big job for the community. MSD’s Bumblebee has a number of parallels to Muhammad Ali. Like Ali, Bumblebee will get its start on the west side of the city. The Waterway Protection Tunnel begins west of downtown and stretches east, generally along the river to the Butchertown neighborhood, where it will turn southeast for another mile or so to its terminus. Bumblebee is a heavyweight, weighing in at 885,000 pounds, and has the strength to push through challenges. It will carve through miles of solid bedrock, moving forward with 3.5 million pounds of thrust and a 22-foot-wide cutterhead applying nearly 1.5 million pounds per foot of torque. Bumblebee will leave a lasting legacy for Louisville. The Waterway Protection Tunnel will help keep Louisville waterways safe and clean by preventing 439 million gallons of pollution from entering the Ohio River and Beargrass Creek in a typical rainfall year. And lastly, like the Ali’s legacy in Louisville, area residents will benefit long after Bumblebee’s work is complete. The main job site, where a pump station will be, along with the 200-foot-deep shafts that provide workers and equipment access to the tunnel, is located in an industrial area along the Ohio River, just west of Louisville’s downtown business, entertainment, and tourism districts. When the tunnel is complete, this approximately five-acre site will be turned over to Louisville’s Waterfront Development Corporation and will be developed into an expansion of Waterfront Park, an award-winning urban greenspace and the city’s prized public front yard. Plans call for a public green space for the community to enjoy, including pathways, footbridges, play areas, fountains, and sculptures. MSD also worked closely with Waterfront Development on the design of the pump station so that it will complement the planned park expansion. About 4 miles to the east is another construction site that will ultimately be the tunnel’s terminus. When the tunnel is complete, MSD will convert a portion of this area to a new public green space complete with paths, trails, a rain garden, and a wetland preservation area. It will serve as a trailhead for the popular Beargrass Creek walking and biking trail. All in all, MSD’s Waterway Protection Tunnel will be an amazing example of engineering, innovation, problem-solving, and partnership — which most people will never see but that creates long-lasting benefits for the entire community. Jacob Mathis, project manager for the Waterway Protection Tunnel at the Louisville Metropolitan Sewer District (MSD), is a professional engineer licensed in Kentucky and Indiana with 15 years of experience managing the design and construction of residential, commercial, military, and municipal projects. Mathis has been with Louisville MSD for seven years, where he has managed the design and construction of MSD’s capital improvement projects required for compliance with the federal consent decree. He has a B.S. in civil engineering from Purdue University. Since 2007, MSD customers have paid a monthly EPA Consent Decree Surcharge Fee with annual rate increases ranging from 5.5 to 6.9 percent. These fees fund the debt service obligations on outstanding revenue bonds for infrastructure projects across the community, including the Waterway Protection Tunnel. In addition to an annual financial audit by an independent CPA firm, MSD financials are reviewed and analyzed by nationally recognized rating agencies. MSD’s current rating is stable per Standard & Poor’s (AA), Moody’s (Aa3), and Fitch Ratings (AA-) assessments. Maintaining or improving these ratings is critical to sustaining MSD’s ability to fund the consent decree and additional infrastructure needs. In addition to wastewater, MSD is also responsible for stormwater management and flood protection. MSD has identified the need for a $4.3-billion Critical Repair and Reinvestment Plan (CRRP) during the next 20 years to address needs in the three areas. A higher credit rating for MSD lowers the interest expense on future bond issues, allowing more funds for the CRRP. Controlled operating expenses and focus on debt management, together with a low-interest rate, have positively impacted the financial ratios that drive the credit rating scores. The MSD successes mentioned above have resulted in an 11 percent improvement in our operating ratio from 2012 to 2017 and interest expense savings of $180 million during the next 20 years from refinancing activity.